London Mayor Sadiq Khan on Sunday (16) called for a second Brexit referendum as he criticised the Conservative party-led UK government’s increasingly “chaotic approach” to the negotiations with the 28-member European Union (EU). 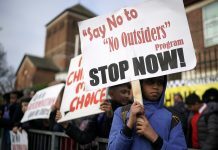 The Pakistani-origin Mayor said the fresh vote should offer voters the choice of staying in the EU against any deal the UK government manages to strike – or against a “no-deal” Brexit, if an agreement cannot be reached. Writing in the Observer newspaper, Khan warned that with the UK due to leave the EU in six months, by March 2019, it now faced either a “bad deal” or “no deal”. “I’ve become increasingly alarmed as the chaotic approach to the negotiations has become mired in confusion and deadlock, leading us down a path that could be hugely damaging – not only to London, but the whole country,” he said. “But the reality is that the abject failure of the government – and the huge risk we now face of either a bad deal or a ‘no deal’ Brexit – means that giving people a fresh say on our future is now the right, and only, approach left for the good of our country,” Khan added. He said the government had failed to put the national interest ahead of party politics. As calls for a People’s Vote campaign for a second referendum has been building up, British prime minister Theresa May had said that “giving in” to such calls for a second referendum on the final terms of the UK’s withdrawal from the EU would be “a gross betrayal of our democracy”. People’s Vote, a cross-party group that includes several high-profile figures and MPs, has been trying to sway the Labour Party to back its campaign and Khan’s open support will come as a welcome boost for the drive. Meanwhile, in a letter to Brexit Secretary Dominic Raab, published by The Sunday Times, Labour’s shadow Brexit Secretary Sir Keir Starmer warned the government that Labour MPs will vote down attempts to force the country into a “blind Brexit”. The Labour Party’s official policy remains to respect the outcome of the EU referendum in 2016, and not to call for a new one but to “leave all options on the table” if a deal is not agreed by Parliament. Party leader Jeremy Corbyn himself has repeatedly failed to rule out the prospect of a second vote, but has consistently said it is not party policy and Labour is not advocating the issue. He will now be under pressure to make a more vocal stance in favour of a second referendum. In a referendum in June 2016, 51.9 per cent voters had backed Britain’s exit from the EU and 48.1 per cent had voted to Remain.